Alberga Manor, Espoo – the Sugar Castle, originally uploaded by Brin d’Acier. I often pass through the grounds of this pink manor house on my way to work. As the weather was nice I decided to draw it. There has been a manor on this site since 1620. This latest incarnation was built in 1876. I don’t know if this neo-renaissance building bears any resemblance to the original. It’s also known as ‘Sugar Castle’ as its owner Feodor Kiseleff made his wealth trading sugar, and wood from sugar crates was used in its construction. 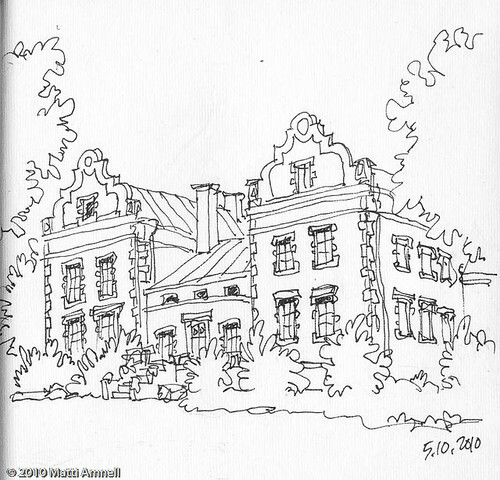 This entry was posted in Sketch of the day, Sketchbook and tagged architecture, espoo, finland, helsinki, ink. Bookmark the permalink. Another lovely sketch – thank you.